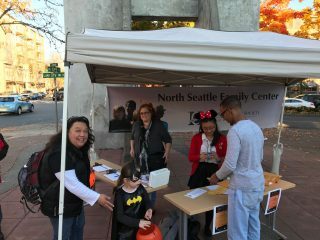 Over 30 Lake City Businesses took part in the 25th Annual Trick-or-Treat Walk sponsored by the North Seattle Family Resource Center and LCFF. It was amazing to see LCW crowded with families on a gorgeous October evening. The turn out was more than we could have ever expected and was a sight to behold. 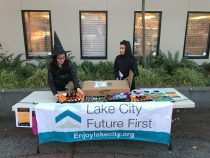 Families had the opportunity to end the evening with the Lake City Lions at the LC Community Center for their annual “Fright Night Festivities” and some treats. 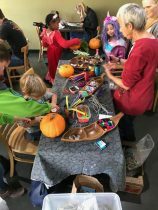 LCFF followed up the event on Sunday at the Kaffeeklatsch with partners; Hunger Intervention, EBB, Lake City Farmers Market, North Helpline and the Watershed Pub to hold the 2nd Annual Pumpkin Palooza. Volunteers from the businesses and organizations came together the night before to clean and prep over 100 pumpkins for the event. 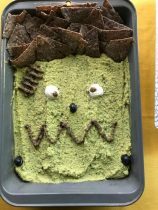 There was live music, healthy “Halloween themed” snacks, prizes and lots of creative pumpkin decorating going on. 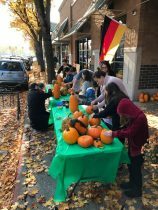 Big thanks to Annette and Brian from the Kaffeeklatsch, Chris with LCFF and Chuck Dickey from the Lake City Lions for procuring the pumpkins for this event and for kids at the North Seattle Family Resource Center. Don’t miss the event next year! 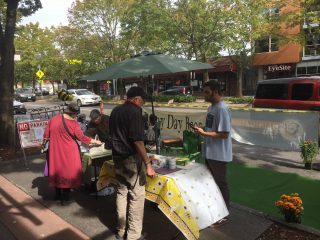 As part of the City’s “Park(ing) Day” event this year LCFF teamed up with Annette and the Kaffeeklatsch to create a pop up park that was all about bee conservation and the importance of bee health to our world. 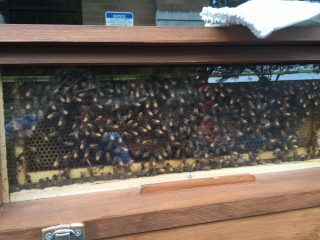 Many thanks to Peter with Rainy Day Bees who had honey tasting and a live hive on display. Also a big thank you to Christine Ranegger, a local bee hobbyist who brought her observation hive on Saturday and to Laura Matter from Seattle Tilth (http://www.seattletilth.org/) who came out to discuss bee friendly gardening and give away free seed packets.Thanks to our wonderful Children’s librarian, Nancy Pew, for stocking our bee park with a ton of great books on bees for kids. 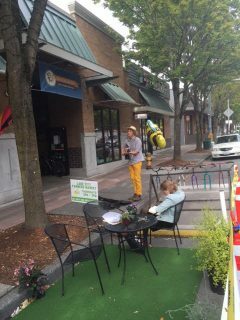 Environment Washington was also on hand Friday with their initiative “No Bees No Food” answering questions and pulling people in for the cause.